Mouse anti human NKX3 antibody recognizes NK3 homeobox 1, also known as NKX3.1, NKX3A or NK3 transcription factor related locus 1. This antibody has been extensively validated for western blotting using whole cell lysates. Mouse anti Human NKX3-1 antibody recognizes homeobox protein NKX3-1, also known as NK homeobox, family 3, A, NK3 transcription factor homolog A, NK3 transcription factor related, locus 1 and homeobox protein NKX3.1. Encoded by the NKX3-1 gene, this transcription factor functions as a negative regulator of epithelial cell growth in prostate tissue. Aberrant expression of NKX3-1 is associated with prostate tumor progression. Alternate splicing results in multiple transcript variants of NKX3-1 (provided by RefSeq, Jan 2012). 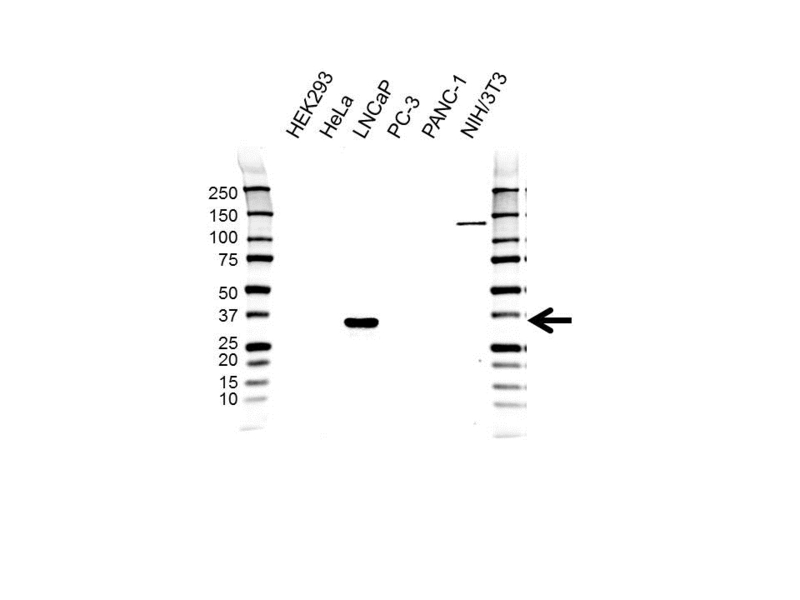 Mouse anti NKX3-1 antibody detects a band of 32 kDa. The antibody has been extensively validated for western blotting using whole cell lysates.